Meghan Markle, Prince Harry step out in Scotland — and one was bitten by a pony! The sweethearts spend the day before Valentine's Day touring Edinburgh, Scotland. Meghan Markle's introductory tour of the United Kingdom continues! The soon-to-be royal joined her fiancé, Prince Harry, on a visit to Scotland and a stop at the iconic Edinburgh Castle Tuesday. The couple was welcomed to the Scottish capital by a crowd of well-wishers — including one with pink nails that Meghan said were "fantastic." Also there to greet them was the Royal Marines Scotland Band and its mascot, a Shetland pony named Cruachan, who took a small nip at Harry while the prince tried to stroke him. 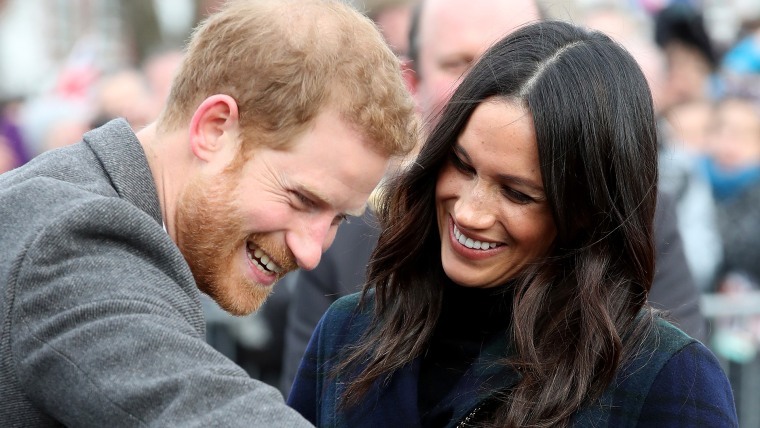 "Hey," Harry said in response to the pony, while Markle, who donned a double-breasted tartan overcoat for the occasion, reacted with laughter. The pair shook hands and chatted up members of the crowd before eventually heading inside the castle for a tour and to observe the firing of the One O'clock Gun, a tradition dating back to 1861 that helped mark time for ships in the area. The couple then headed to Social Bite, a café that employs people who used to be homeless and helps distribute food and hot drinks to the destitute. Inside, Prince Harry, 33, and Markle, 36, met with staff, toured the kitchen and learned more about the social enterprise, which donates all of its profits to charity. The couple’s trip to Scotland is their fourth joint appearance together since announcing their engagement last November. Harry has been introducing his American fiancée to her new nation, with previous visits made to charities based in Nottingham, south London’s Brixton neighborhood, and Cardiff, Wales. The couple are scheduled to get married May 19 at St. George’s Chapel on the royal grounds of Windsor Castle. Earlier this week, Kensington Palace revealed details about the ceremony, including a carriage procession the couple plans to take following their church service.